Recently Instagram added the “multiple photos” feature, where an image post can include up to 10 images and/or videos which you can swipe through. Although sharing an album of shots from a trip or shoot is the most obvious choice, I am always on the lookout for new ways to share my work and the stories behind it. Below are some creative ways to use multiple photos in my Instagram posts, as well as a short primer on how to use this new feature. A great way to show off your action photography and tell a story. I really like this for animals in action, but you can be creative and show things like the passage of time over a landscape. White Ibis taking flight from where it had been hunting in the surf. This takes a little more work, but produces a really nice effect. Start with a panoramic photo cropped to a whole number ratio (2:1, 3:1, 7:1, etc.). This means the longest side is a whole number multiple of the shortest side. For example, an image that is 3600 pixels wide by 1200 pixels tall would be a 3:1 ratio (3600/1200=3). In either Lightroom or Photoshop, set your crop tool to your desired ratio, and trim your photo to that. Once you know your ratio, divide it into squares equal to the larger number in the ratio. For example below I have a 3:1 ratio panorama. If I divide it into squares, I will have three equal sized square images. Personally, I use guides to make sure I have a clean transition between images, just divide your long side dimensions by the ratio, and put a guide at each multiple of this amount. Load them to Instagram, from left to right in order of appearance. Now your followers can swipe through the scene to see a full immersive view. You can load up to 10 images, so don’t be afraid to go nuts and load a huge panorama! Panorama of Crescent Lake and the surrounding mountains in Lake Clark National Park Alaska. Original Image – 10625px by 3451px, ratio of 2.39:1. Cropped and Resized – 3240px by 1080px, ratio of 3:1. Divide your width by the ratio (in this case 3), then place a vertical guide along each multiple of that: ex. 0, 1080, 2160, 3240. Crop and save each section, in this case I end up with 3 files. 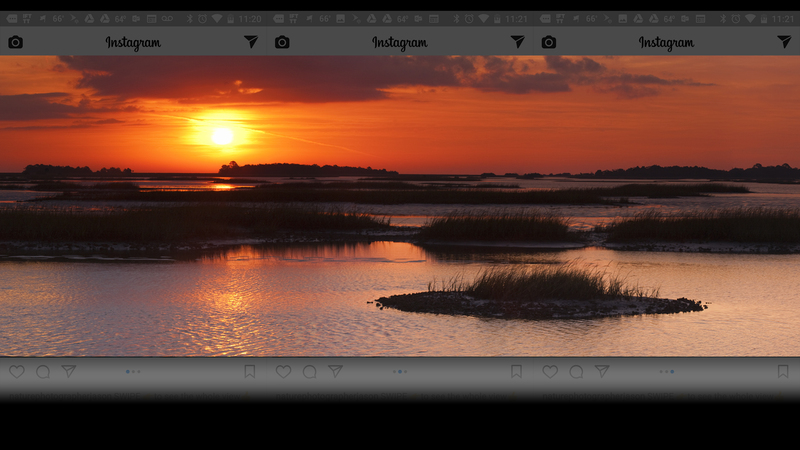 Then, in Instagram, select the images you want to include, working from left to right where your left hand shot will be #1. Click next, do whatever you like with the instagram filters, enter your caption, and post. If you squared up your shots right, each swipe should be a seamless transition through the scene. Some of the best ways to engage your Instagram followers are by teaching them something new or by asking them for their opinions on your images. By using multiple photos, you can show before and after examples of your work, share your post-processing tips, or survey what your followers like when selecting photos for your portfolio. Comparing and contrasting your images can really engage them while showcasing your skills as a photographer. Which do you like, the Badlands in color or black and white? This is a great way to make people feel like they were there with you while you were shooting. The multiple photos feature allows you to combine stills and video into one post. Show off your shots, and make the last frame a behind the scenes video of your photo shoot. Stills and Video from a 2 hour time lapse of sunrise over Prince William Sound in Alaska. Bromeliad, with a visitor on its flower. When you tap this icon, you can select multiple images from the thumbnails at the bottom of your screen. As you select each image, a number inside a small blue circle will appear over top of it. This is the order in which they will appear as you swipe. You can deselect an image just by tapping it again. Before you start, keep in mind you are limited to using square images (1:1 ratio). If you use a rectangular image, Instagram will crop it. You do still have control over where that crop occurs, just make sure you are using images that will look good as a square! While it is certainly not something to use for every image you post, it is a way to show off your images in a different light, or tell a story about your work. I hope you have fun with this feature, and I would love to hear what other creative ways you have found for using it! Jason is a nature, wildlife, adventure, fine art andstudio photographer who has been photographing all the amazing things this planet has to offer for nearly two decades.Also a writer and photography instructor, his latest venture is Cypress Creek Studio, a combination indoor and outdoor creative and learning destination for photographers and other artists. When not writing about himself in the third person, he enjoys sunsets and long walks on the beach while carrying 40 pounds of camera gear. He can most often be found wading through a swamp, hunting down a good burger joint, or enjoying time with in the great outdoors.